Azura is a ship that has been tailor-made for the British market. From the entertainment roster of former TV stars to the excellent range of ales and gins served in the ship's numerous bars. The prices on board are in pounds sterling, too. The ship offers something for everyone: from Brodie's sports bar playing Premier League football around the clock (as well as evening bingo and pub quizzes) to ballroom dancing lessons in the impressive atrium and a posh curry in Sindhu. 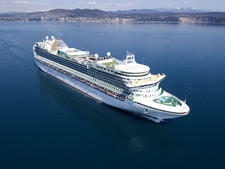 Azura is a versatile ship that is able to cater to a range of different passengers -- as long as they are Anglophiles. In April 2015, Azura underwent its first refurbishment since coming in to service in 2010. The multimillion pound renovation saw improvements to many areas of the ship not visible to passengers (pipes carrying drinking water were replaced) as well as more obvious improvements to soft furnishings in the corridors, staircases and main restaurants. The buffet areas were also updated (although the questionable layout remains) while the restaurant Seventeen became The Epicurean, after sister ship Britannia's high-end for-fee eaterie. 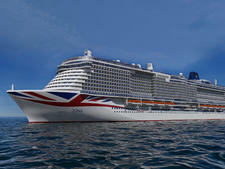 The most obvious change to come from the refurbishment, however, was the giant Union Jack livery that was painted on the ship’s hull as part of a fleet-wide branding. 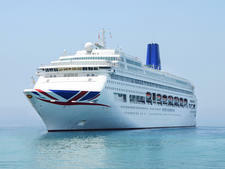 A not-so-subtle reminder of P&O Cruises' uniquely British brand of cruising. With 3,100 passengers onboard, the ship can feel crowded -- especially on sea days when the sun loungers are packed tightly on deck -- exposing a real lack of shaded areas. However, passengers wanting a more luxurious experience can book themselves in to the much quieter Retreat (Deck 17, forward) --a private VIP area with comfier loungers and waiter-service. The Retreat is the line's take on the popular ship-within-a-ship concept that has become popular on both MSC Cruises and Norwegian Cruise Line. A two-week pass costs £350 for two passengers, which is pricey enough to mean that it never gets too busy. The decor in the public areas feels fresh, with plenty of modern artwork lining the walls; however the cabins do feel slightly dated, given that the ship was only built in 2010. Life onboard revolves around the classy central atrium, from which Azura's many amenities -- including a lot of retail outlets -- can be reached. Housekeeping and restaurant staff are friendly and work tirelessly, trying their best to cope with any number of queries. However, staff on reception were often harried and unhelpful. 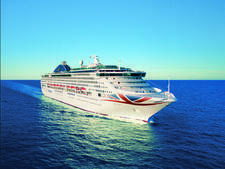 Azura, along with sister-ship Ventura, represents a sea-change for P&O Cruises since it started to launch bigger and bigger ships packed full of bars, pubs, lounges and restaurants aimed at attracting first-time cruisers. While this has caused some friction within the company's traditional fanbase (who were also disappointed to see the line's smallest ship, Adonia, be sold off to Azamara in 2018), it has meant a far more relaxed style of cruising. Azura benefits from this with everything from an informal pizza bar to an extended kids' club -- plenty for the modern family to enjoy. 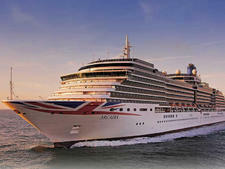 Given P&O Cruises' history it's no surprise its passengers are almost all Brits. However, the age of those onboard varies greatly. Azura has kids' clubs for children aged between two and 17 (those younger than two must be accompanied by a guardian) so is a great value option for young families. If you would rather not fraternise with youthful cruisers then book accordingly -- cruises during school holidays are going to have a lower average age than two weeks in the Canaries during the winter. 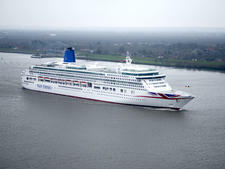 There is also the line's mini-cruises out of the U.K., which are known for being a hit with stag and hen parties. It all depends on when and where you are going. Formal nights (known as black tie nights) onboard Azura are pretty serious affairs with most men opting for tuxedos or dark lounge suits. Women typically opt for ball gowns, cocktail dresses or trouser suits. Those not wanting to dress up are welcome to do so but are restricted to buffets and certain bars, which operate as evening casual. On formal nights, black tie dress is required in the Blue Bar, Planet Bar, Sindhu and the three main dining rooms. On other nights (which are known as evening casual on board) it is advised that a dress or casual separates are fine for ladies while an open-necked shirt and tailored trousers or smart jeans are fine for men. Shorts are not allowed during the evening. 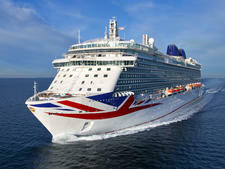 Tips are not included in the fare and automatically added to your onboard account at £7 per person, per day -- which will be charged to your registered credit card at the end of the cruise. This includes tips to waiting staff, although many passengers give a cash tip to their favourite members of staff at the end of the cruise. The onboard currency is pounds sterling.